Julia, 92-years-old, poses with her son, Nicholas, and Christian and Muslim volunteers who had come to decorate their modest apartment with a Christmas tree Dec. 8 in Beirut. Scouts and volunteer youth from the Knights of Malta Lebanon, a Catholic organization, and “Who is Hussein,” a Muslim Shiite organization, decorated homes of poor elderly. 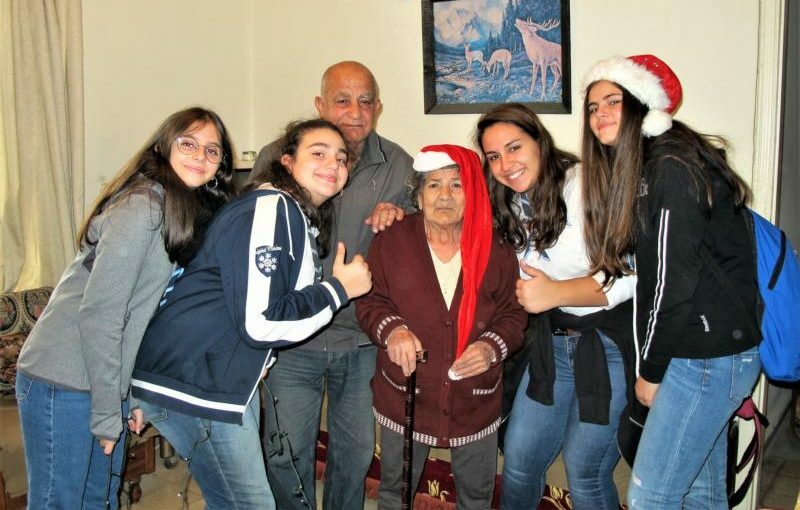 BEIRUT (CNS) — On a gloomy, rainy Saturday morning in Beirut, 92-year-old Julia enthusiastically greeted her visitors, Christian and Muslim youth, who had come to set up a Christmas tree in her modest apartment. Julia, a Maronite Catholic, was one of 10 beneficiaries Dec. 8 of a Christmas tree decoration project for poor elderly that brought together Lebanese volunteers from the Knights of Malta, a Catholic organization, and “Who is Hussein,” a Muslim Shiite organization, as well as Girl Guides associated with the local St. Vincent de Paul.